It’s only in the quietness of soul … in the peace, in the rest … that perspective is rightly restored to full confidence in Him. Because when my mind is working on overdrive, when I’ve got a tight grip on my own future plans, when I don’t make the effort to stop and spend time with Him, when I let go of the quiet, I believe the lie that I can do this on my own. But in the quiet, I recognize my desperate need for Him. For His direction. For His peace. For His presence. And from that place, I lean into Him. I trust Him. I depend on Him in full confidence. Because He is. And He always will be. This quiet confidence … this life … it’s not about trying harder. It’s about resting more. This entry was posted in 31 Days (October 2012) and tagged 31 days (confidence), confidence, peace, quiet confidence, quietness, rest, trust on October 31, 2012 by Emily Gallimore. I don’t serve a small God … so why do I act like it? When I think I have to write the details of my own story, I act like I serve a small God. When I act like taking a wrong turn on this faith journey is the end, I act like I serve a small God. When I worry so much about and agonize over which direction is right, I act like I serve a small God. But just because His timing is different than mine, just because He allows me to make mistakes that ultimately draw me into deeper dependence on Him, just because I don’t perfectly understand what He’s doing or where He’s leading, just because I can’t see the whole picture, doesn’t mean He’s a small God. He’s such a big and mighty and powerful God that He knows each detail from beginning to end. He knows how all the pieces fit together because He sees the big picture … the whole picture … while I can only see one very small miniscule part. He knows the eternal story because He wrote it. I’ve spent far too much time worrying about what comes next in my story. Because there is peace in His presence and confidence in Him who holds tomorrow. This entry was posted in 31 Days (October 2012) and tagged 31 days (confidence), eternal perspective, peace, power, quiet confidence, story, trust, worry on October 30, 2012 by Emily Gallimore. This entry was posted in 31 Days (October 2012), Photo of the Week 2012 and tagged 31 days (confidence), fall, photography, quiet confidence, trust on October 28, 2012 by Emily Gallimore. 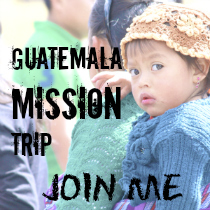 After settling into the realization that the type of position I had been working towards was pretty much off the table and that the chances of a similar position becoming available in the near future were slim to none, I honestly wasn’t sure if I would hear from the missions organization again. The end of the month was fast approaching, and it was my understanding that if I hadn’t heard anything by then, I wouldn’t be receiving an invitation to attend the required orientation the next month. However, a short time later, I did receive an invitation, but because there still wasn’t a likely opportunity for placement, I turned it down … ultimately withdrawing my application from “active” status and bringing this process to a formal close. I was disappointed, yes, though honestly not to the extent I would have expected. And while it was tempting to view this almost-six-month process as wasted time … or even failure … I choose to trust that the Lord had and/or has a purpose even for that. I choose to trust that if this wasn’t where He was leading, He will faithfully guide to the right thing, and if serving in vocational missions is still the right direction, then He’ll provide a different way. Because I knew (and know) that God was (and IS) the same. Still sovereign. Still good. Still in control. 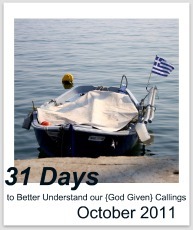 This entry was posted in 31 Days (October 2012) and tagged 31 days (confidence), missions, quiet confidence, sovereignty, trust on October 26, 2012 by Emily Gallimore. What was I supposed to do with that?!? Well, I did take a breath, and then I sought clarification. I sent an email back to my placement coordinator, once again pointing out the specific position that I had initially inquired about. It wasn’t that I had no interest in changing my ministry focus if that was where the Lord was leading (and I was desperately trying to figure out where, exactly, He was leading in all of this), but at the same time, I felt no peace about completely turning away from a specific ministry aspect that was part of the initial position that had first compelled me to pursue this process in the beginning. Since I don’t know French at all, that certainly changed everything. . . 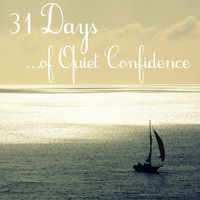 This entry was posted in 31 Days (October 2012) and tagged 31 days (confidence), confidence, hope, missions, quiet confidence, trust on October 24, 2012 by Emily Gallimore.